The Mismeasure of Science: Stephen Jay Gould versus Samuel George Morton on Skulls and Bias. 2011. J.E. Lewis, et al. PLoS Biol 9(6): e1001071. Apparently it was Gould, not Morton, who got it wrong. Stephen Jay Gould, the prominent evolutionary biologist and science historian, argued that “unconscious manipulation of data may be a scientific norm” because “scientists are human beings rooted in cultural contexts, not automatons directed toward external truth”, a view now popular in social studies of science. In support of his argument Gould presented the case of Samuel George Morton, a 19th-century physician and physical anthropologist famous for his measurements of human skulls. 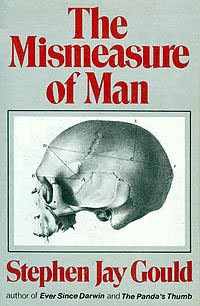 Morton was considered the objectivist of his era, but Gould reanalyzed Morton's data and in his prize-winning book The Mismeasure of Man argued that Morton skewed his data to fit his preconceptions about human variation. Morton is now viewed as a canonical example of scientific misconduct. But did Morton really fudge his data? Are studies of human variation inevitably biased, as per Gould, or are objective accounts attainable, as Morton attempted? We investigated these questions by remeasuring Morton's skulls and reexamining both Morton's and Gould's analyses. Our results resolve this historical controversy, demonstrating that Morton did not manipulate data to support his preconceptions, contra Gould. In fact, the Morton case provides an example of how the scientific method can shield results from cultural biases. Thanks to Sukie for the link!